There are many ways to enjoy eating al fresco in and around Totnes with delicious menus at riverside restaurants, pretty pub gardens and high street tables, but why not take your open air eating to another level and have a picnic in a unique location with far reaching views of the countryside. With July being National Picnic Month what better time to do so. When it comes to deciding where to kick off your shoes and lay your blanket we have many beautiful locations for you to try. Why not explore the River Dart and neighbouring coast from a whole new perspective with Canoe Adventures and Sea Kayak Devon and choose a secluded spot along the way to stop for lunch. Or with the Dart running through Totnes you can sit along the bank of the river and watch the boats go by while enjoying your plate of nibbles. There are also many natural and leafy parks and gardens in and around town and on Dartington Estate where you can stop and relax, enjoy your food at leisure and watch the children play. You could combine your picnic with a short walk or cycle from Totnes to Sharpham Cheese and Wine, Dartington Estate or the Shops at Dartington where you can stock up on more local food and drink, have a wander and soak up the superb views of each location. Take a steam train to Buckfastleigh with South Devon Railway where you can walk (or take a bus) to Buckfast Abbey and enjoy your food in the stunning grounds, or walk along the river while listening to the birds sing. Climb to the top of Totnes Castle and gaze at the wonderful views of Totnes and beyond or visit Berry Pomeroy Castle, both offering the perfect location to enjoy your refreshments. When it comes to deciding what to pack for your picnic the wide variety of delis, cafes, independent shops, farmer’s markets and bakeries in Totnes, Dartington and Sharpham mean you can ditch the soggy sandwiches and create a fresh, local and seasonal feast fit for all. If you fancy some Devon Blue or Sharpham Rustic cheese to go with your crusty bread, visit Sharpham Wine and Cheese or Country Cheeses and Saveurs, The Old Bakery or Flour & Rice for the loaf. For some fresh fruit and the all important salad grown locally in Devonshire soil try Annie’s or The Happy Apple, or if you’re feeling more Mediterranean why not grab some olives, charcuterie or continental cheeses from Mangetout, Jano or Amalie’s Deli. And no picnic is complete without a slice of homemade cake so stop off at Waterside Bistro or one of the many cafes or bakeries in and around town for some tasty treats. Most cafes and independent food outlets in town will also supply take away drinks from the likes of Luscombe to keep you hydrated on those balmy summer days...or why not sample a bottle of something fizzy or fruity from the Totnes Wine Company, the only shop in town to stock the entire range of Sharpham wine. 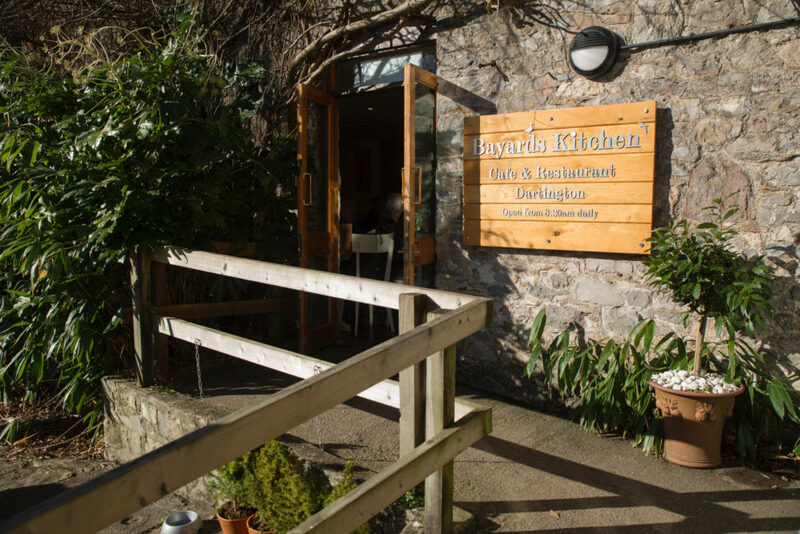 For those who’d like all the pleasure of eating in nature but don’t have time to prepare the food, The Kitchen Table specialises in outside catering and sources all of their key ingredients from within 30 miles of Totnes, so you will get quality, local food without any of the hassle. Don’t forget to pack your sun cream or raincoat for those unpredictable days but most of all, stop, relax and enjoy your day being at one with the world. 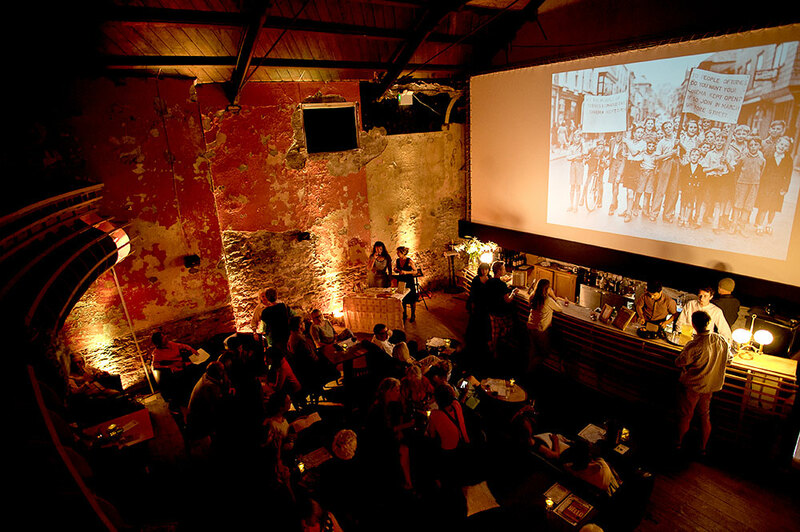 Totnes Cinema CIC is a social enterprise, set up by a local couple, passionate about film and excited about Totnes. So far the project has been entirely funded by local donations and memberships and the success of its carefully chosen programme, and we still have plenty more to do!! All the bar staff, stewards, and musicians volunteer their time and are paid with the chance to watch the film. Totnes Cinema is located in the heart of Totnes, down a hidden passageway just off the High St. Our mission was to bring back the magic of cinema to our local town. We were inspired by a wonderful photograph, taken in the late 1940s of boys holding banners saying “Save our Cinema,” and in true Totnes style, they marched up the High St to make their feelings known. There had been a cinema in Totnes from the early days of film and the last remaining one, The Romany, closed its doors in 1964 due to falling audiences. The building became the well-loved Totnes Library until its expansion and relocation, and the building fell empty. As a local couple, film lovers and with teenage children, we took on the challenge of re-creating a cinema for our local town center to create a social and cultural hub in the town. We have an amazing array of new or rarely seen films with real power and importance for our lives and communities - about climate change, our food, our politics, our environment, our wildlife - and our future. For the first time, the festival is being held over five days at three cinemas. At the Totnes Cinema there are three showings: Faces Places, Agnes Varda’s latest film and Ai Weiwei’s Human Flow, as well as a poetry, film and music event with Matt Harvey and jazz group Shadow Factory. Plus FREE cafe style screenings of short films by the Next Generation. The Barn Cinema at Dartington shows Bruce Parry’s Tawai as well as Albatross, revealing the effects of plastic on albatross chicks. At the Civic Hall The Worm is Turning charts the effects of chemical agriculture in India and In our Hands explores the idea of food sovereignty. Disturbing the Peace follows the transformation of Israeli and Palestinian fighters, from soldiers to peace activists. Power Trip highlights how media and lobby groups shape the public perception of fracking. Saturday evening honours the life of filmmaker & ocean conservationist Rob Stewart with Revolution followed by the UK PREMIERE of Sharkwater Extinction, which investigates the corruption of the pirate fishing industry. Just 37, Rob tragically died while making this film; his work highlights the environmental threats posed to the oceans & the world and the ways in which young people are helping to find solutions. In the centenary year of some women getting the vote in the UK over half our films are F-Rated: a classification for any film directed or written by a woman. What Tomorrow Brings observes one year at a girls’ school in an Afghan village. The Barefoot Artist chronicles Lily Yeh, a community artist in troubled areas. Nearer to home, 9 of our 13 shorts by young people carry the F rating. Most screenings offer discussion time with film-makers or local experts, including Rob Hopkins, Jacqi Hodgson and Guy Watson. Plus there are four free workshops for children and adults. We are very excited about our programme. Check out our website www.transitionfilmfestival.org.uk and make it a date to come and join us!